The items can be collected from our warehouse in Stockholm, Sweden. We deliver within Stockholm and nearby cities and sometimes to the southern parts of Sweden. Some of our furniture is sold at Kafé Copacabana, Hornstulls Strand 3. Smaller items can be shipped abroad using the Swedish postal service. For sending goods within Sweden we also use Schenker, DHL and Bussgods. 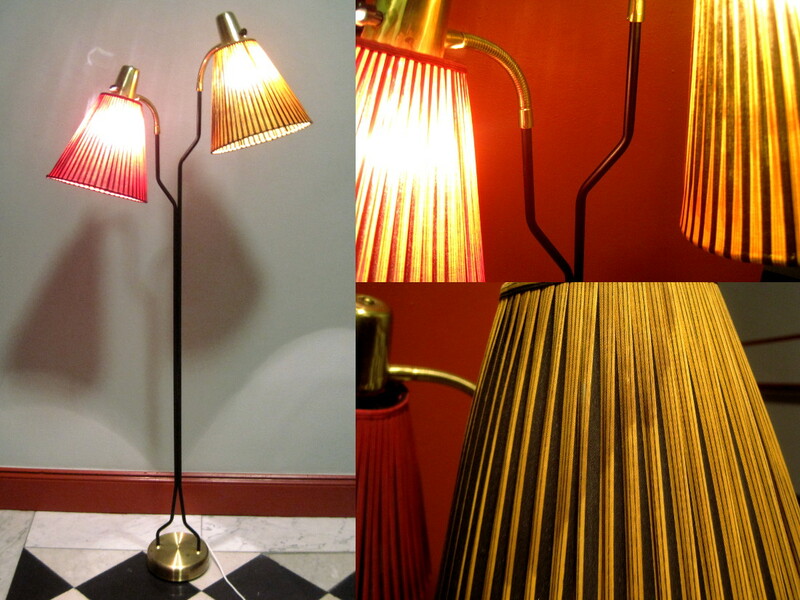 Swedish 50's or 60's double arm black lacquered metal floor lamp by Eskilstuna Elektrofabrik. One of the shades with wear and discolouration to the original fabric, Re-wired with flar europlug. H=140 cm. 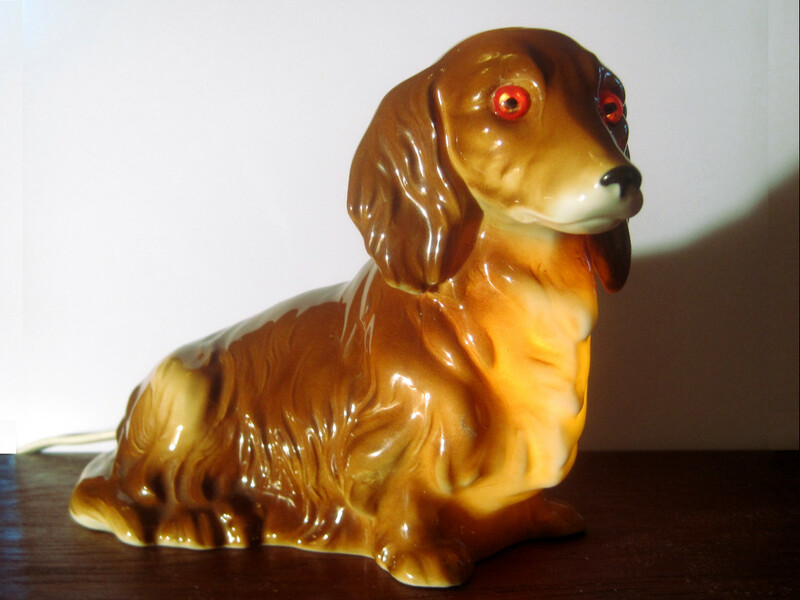 West German long hair dachshund perfume lamp, marked Western Germany and probably manufactured by Cortendorf. Length 20 cm, height 13 cm. Old wire without switch, may be replaced with a new one with switch and flat europlug at an additional cost of 50 SEK. 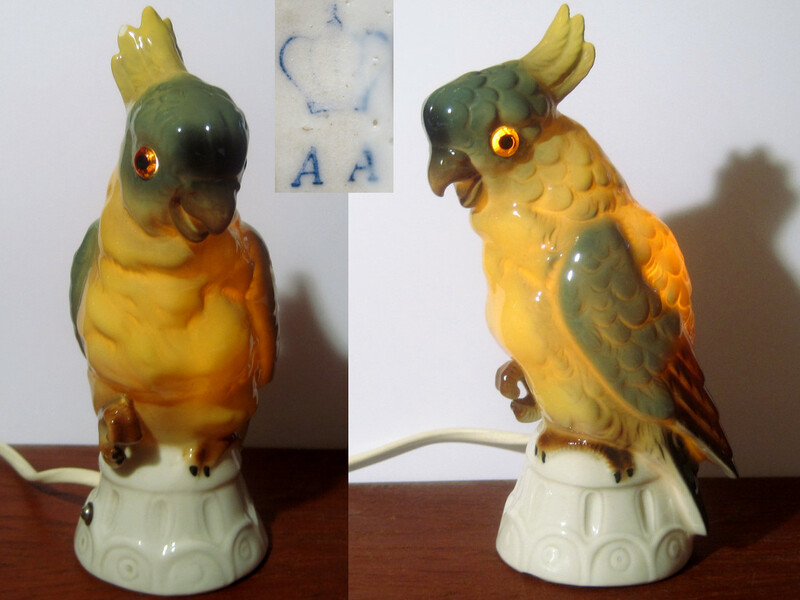 Cockatoo parrot bird perfume lamp by Porzellanfabrik Keramika Inh. Arno Apel i Lauenstein, Bavaria. The factory was active 1954-74 (marked crown over A A). Height 17 cm. There's a chip to the bottom, hardly noticable when the lamp is standing. Old wire, may be replaced with a new one with flat europlug at an additional cost of 50 SEK. 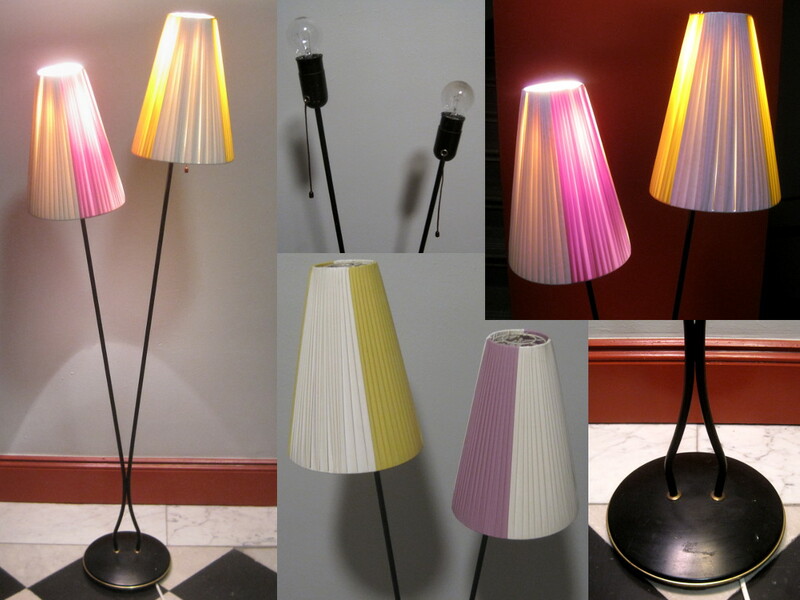 Swedish 50's or 60's two arm black lacquered metal floor lamp with plastic ribbon shades in white, yellow and mauve/purple. Base is marked EAE. Re-wired with flat europlug. Total height 132 cm. 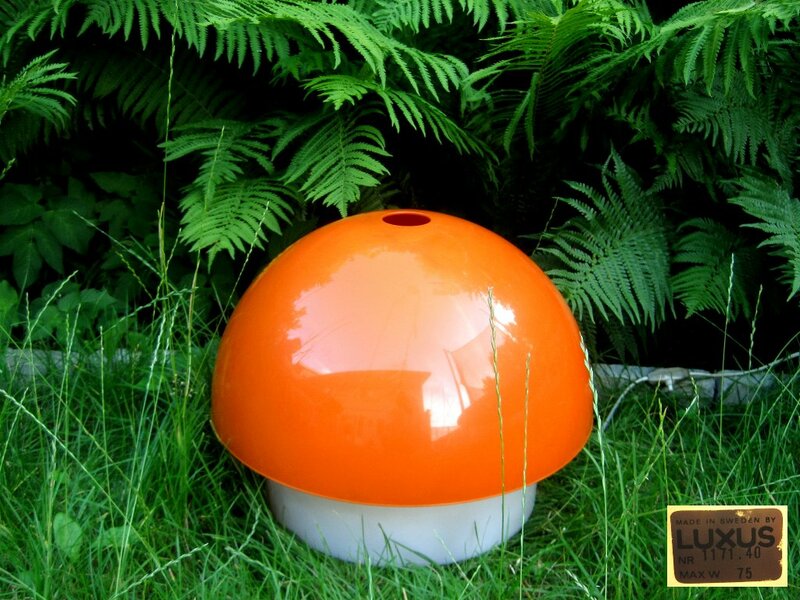 Large orange glass table lamp by Flygsfors. 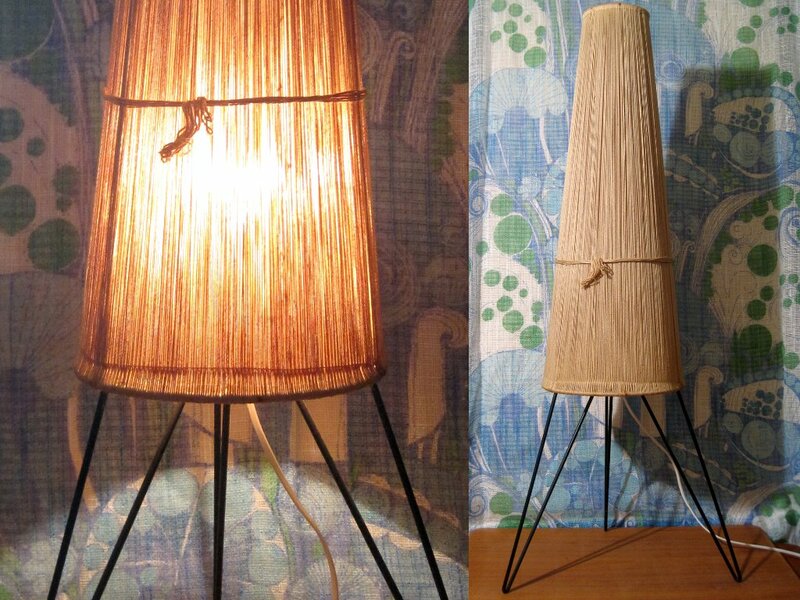 Height 36 cm+lamp fitting. Older plug, may be replaced with a flat europlug at an additional cost of 50 SEK. 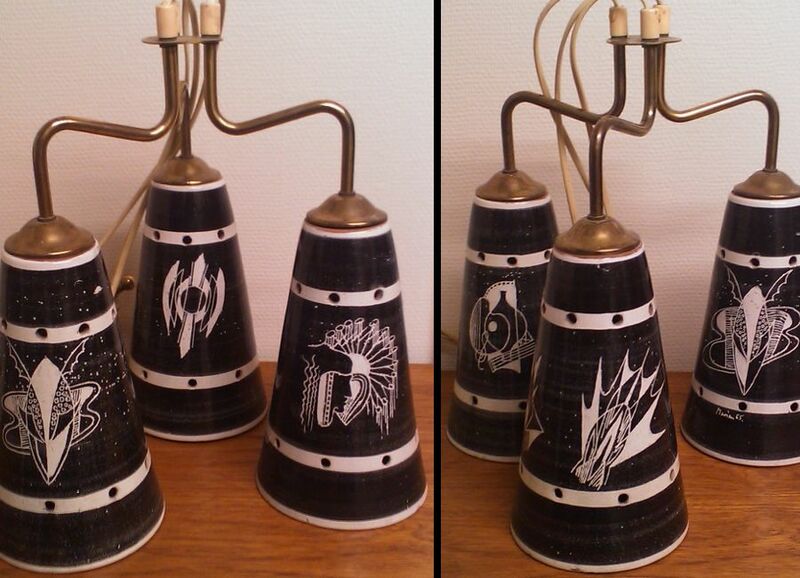 50's or 60's rocket shaped floor lamp. Height 100 cm. Small ceiling lamp IKEA Nift 1963. Made by Kronobergs Belysning. H=17 cm, W=16 cm. 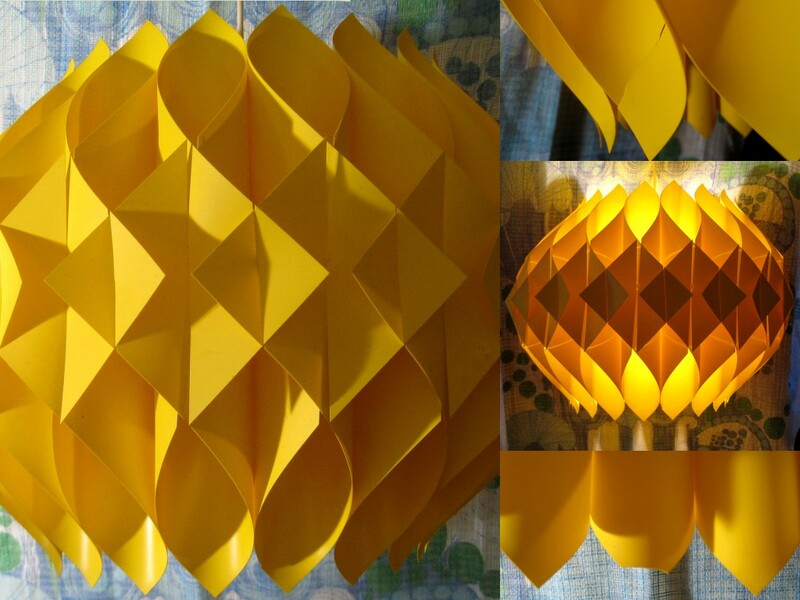 70's large, yellow ceiling light, the model was sold by IKEA and Hoyrup. Diameter 50, height 35 cm. Some damages as seen on picture. 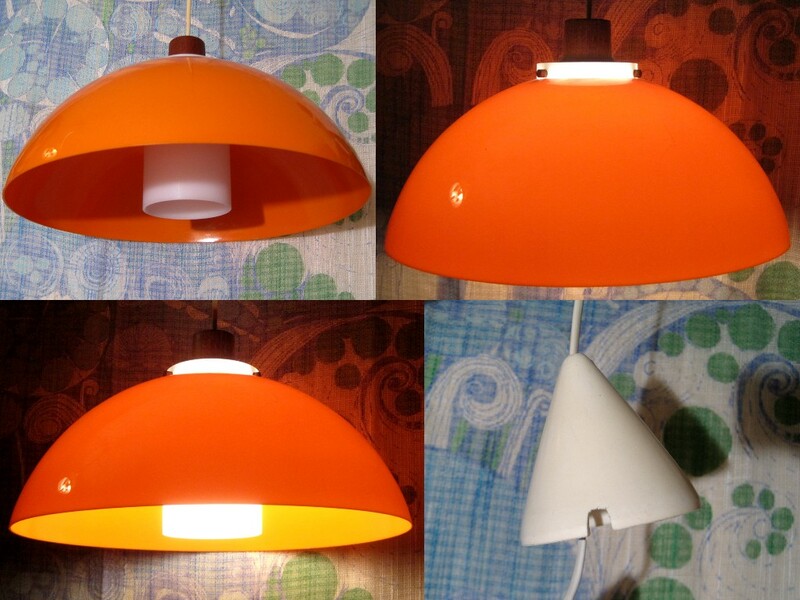 White and orange lacquered metal ceiling light by Hans-Agne Jakobsson AB Markaryd, model T 723. Some wear to the white lacquer on the upper part of the shade. Diameter 36, height 20 cm. 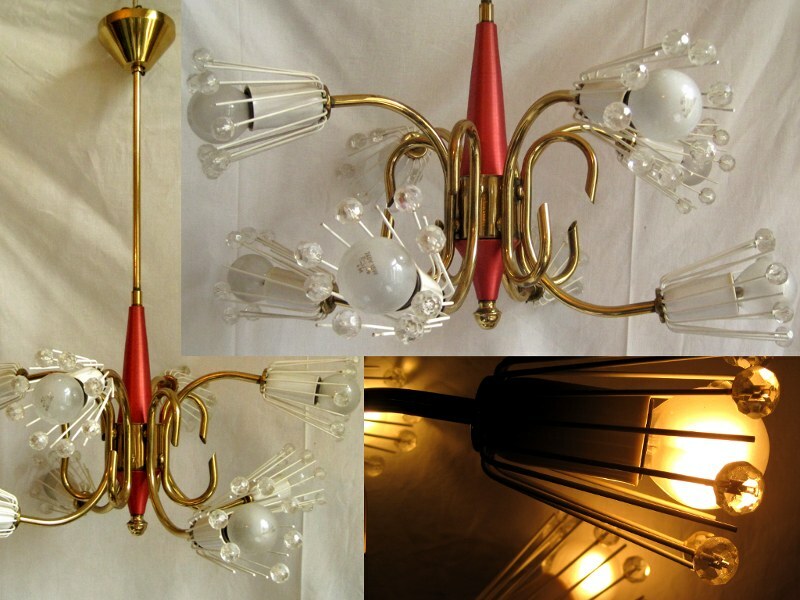 Swedish 60's glass & teak ceiling lamp. The teak cup has been mended, not noticeable when hanging. 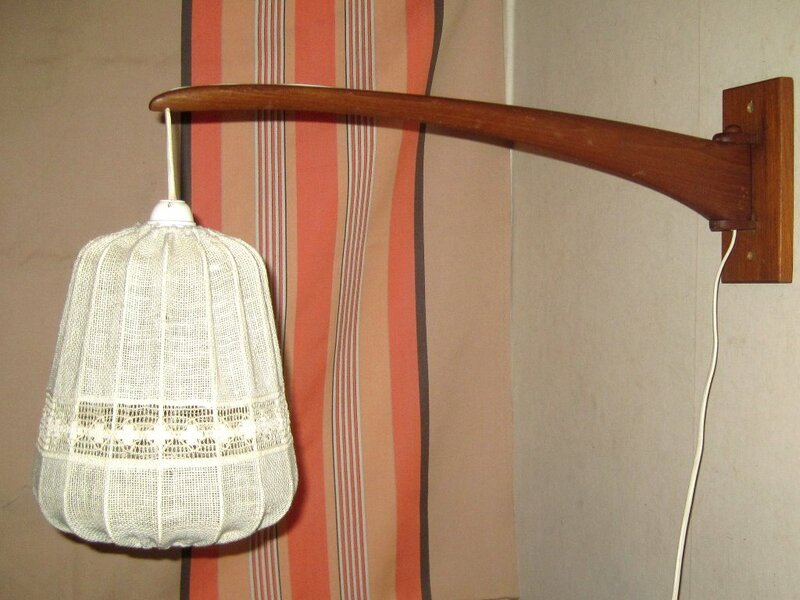 D=25, height of the shade 22 cm, height including the teak cone 39 cm. 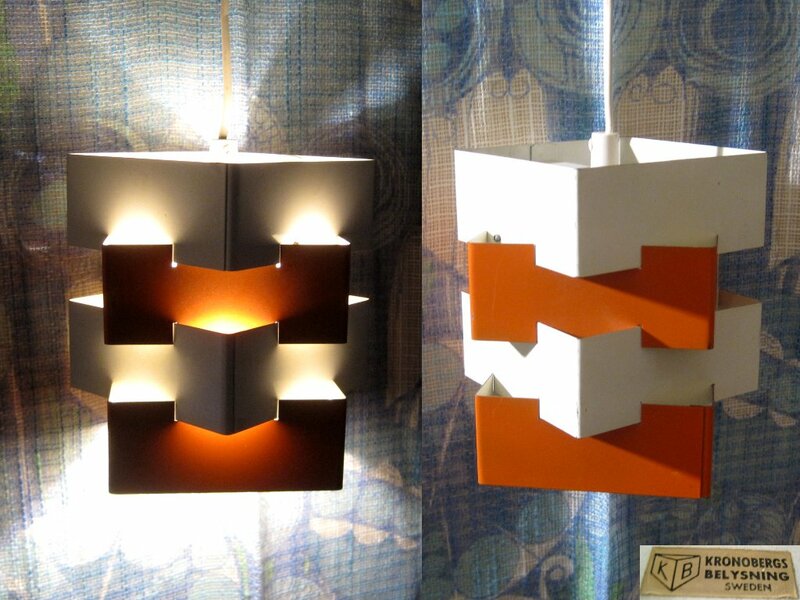 Swedish Luxus orange & white plastic ceiling lamp with teak stained wood detail, designed in the late 50's. Diameter 40, height 22 cm. 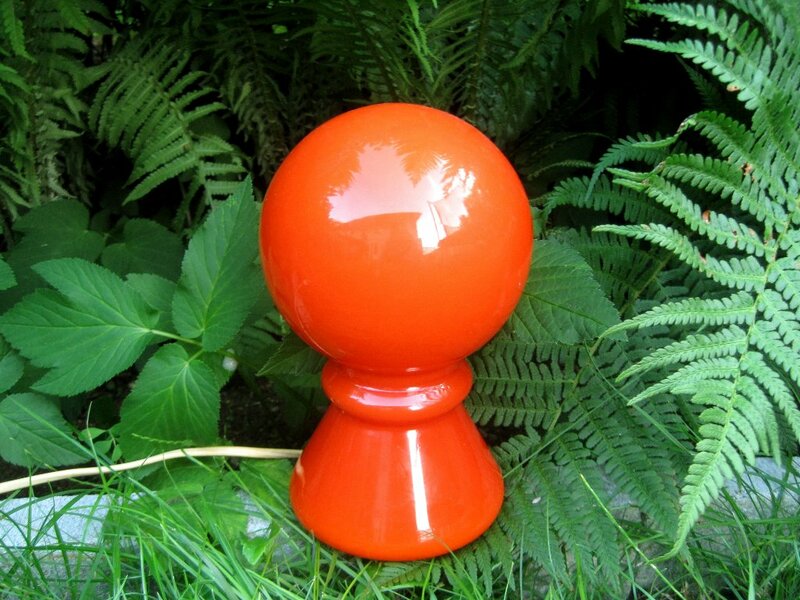 Luxus 1171 Myko Swdish 70's acrylic table lamp. Sligtly darker spots on the shade. Diameter 40, height 30 cm. 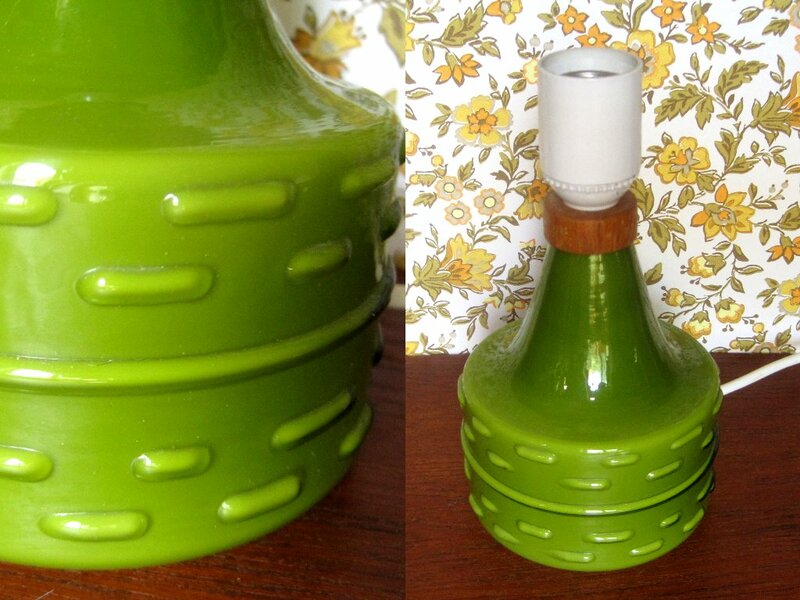 Swedish 60's green glass small table lamp, probably made by Flygsfors. Total height 19,5 cm. 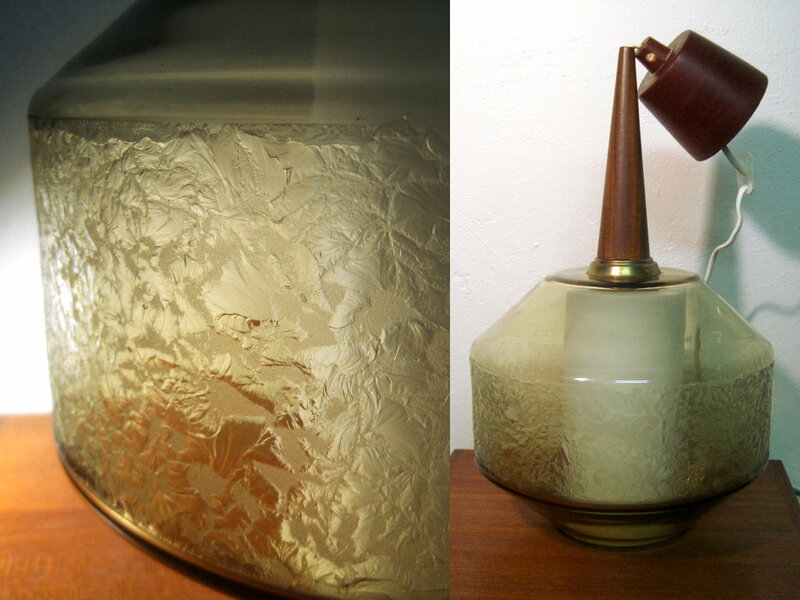 60's glass table lamp. Height 19 cm. 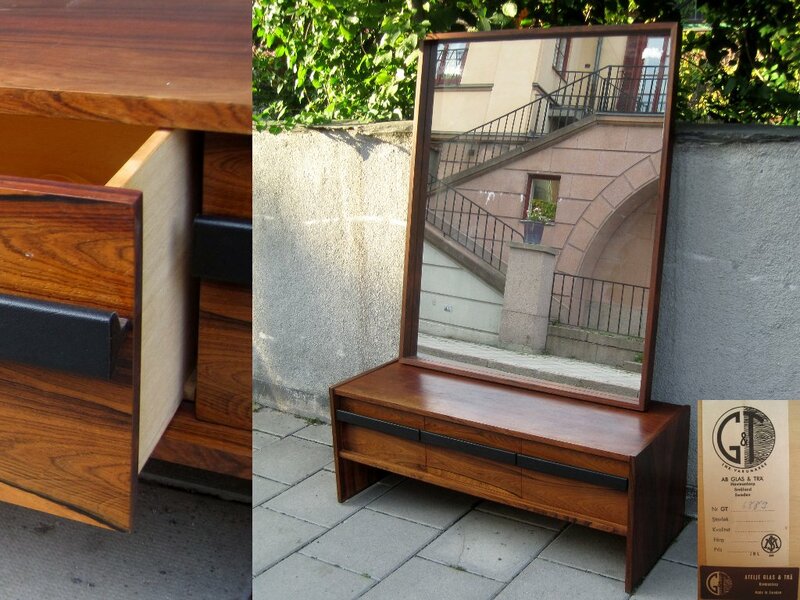 Swedish 60's rosewood large mirror and low chest of drawers by Ateljé Glas & Trä G&T Hovmantorp. A few W=116, D=45, H=45 cm, mirror 122x100 cm. Chest of drawers with a few spots and scratches and minor damage to the veneer on the edge towards the wall. 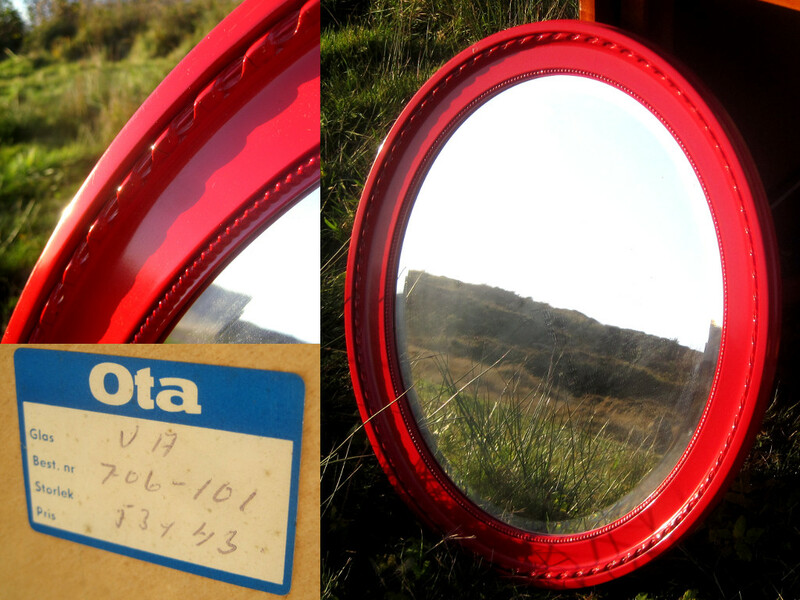 Oval red lacquered wall mirror labeled Ota. H=63, W=52,5 cm. 50's eight arm chandelier by Emil Stejnar, Rupert Nikoll, Austria. Brass and anodized aluminium with round Swarovski chrystal prisms, missing two prisms. Diameter 50 cm, total height 63 cm. 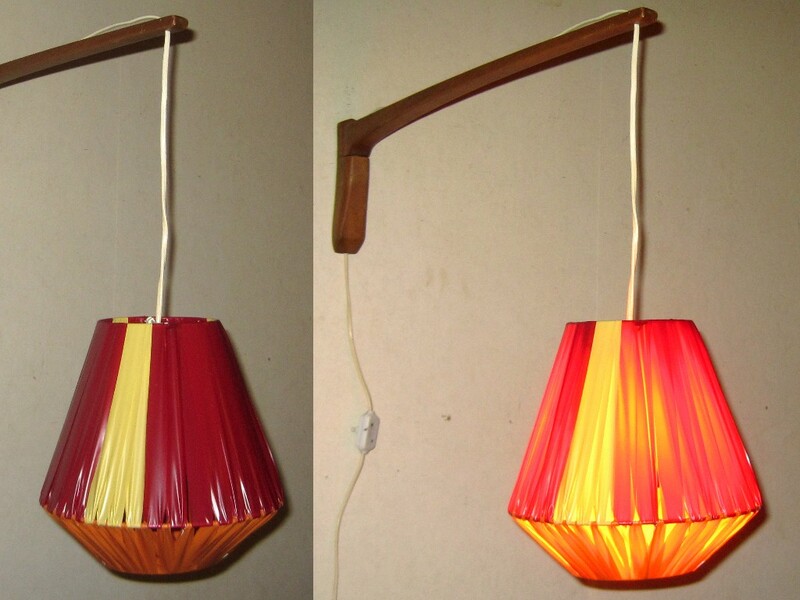 Teak wall lamp, shade has new plastic ribbons in dark red, light yellow and orange. Length 62 cm. Older plug, may be replaced with a flat europlug at an additonal cost of 50 SEK. 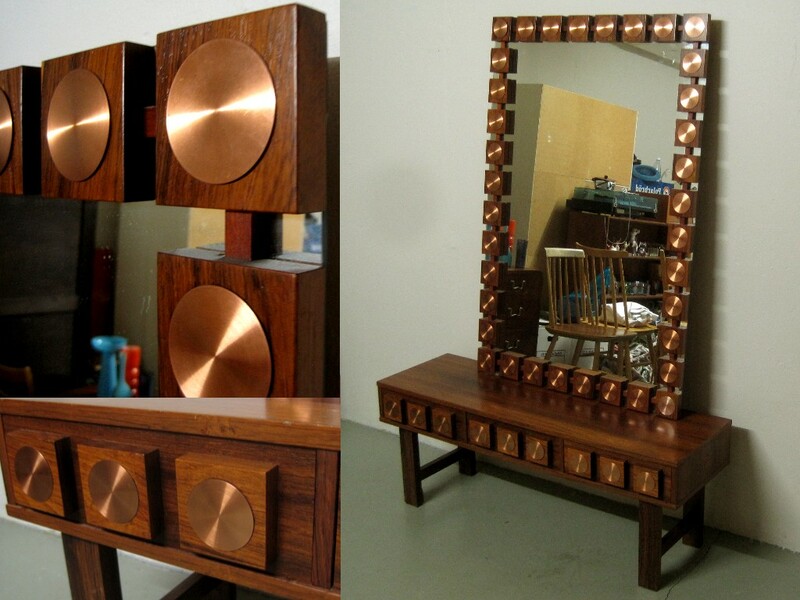 Swedish 60's rosewood & copper large mirror and low bench or chest of drawers by Ateljé G&T Glas & Trä, Hovantorp, Ewa Wrangel & Lars-Göran Nilsson. Minor, hardly noticable damage to the veneer. Mirror 120x80 cm, bench 115x35, height 34,5 cm. 50's teak wall lamp (C.O. Hanson 1959 is written on the backside). Some wear to the fabric. Length 60 cm. Older plug, may be replaced with a flat europlug at an additional cost of 50 SEK. 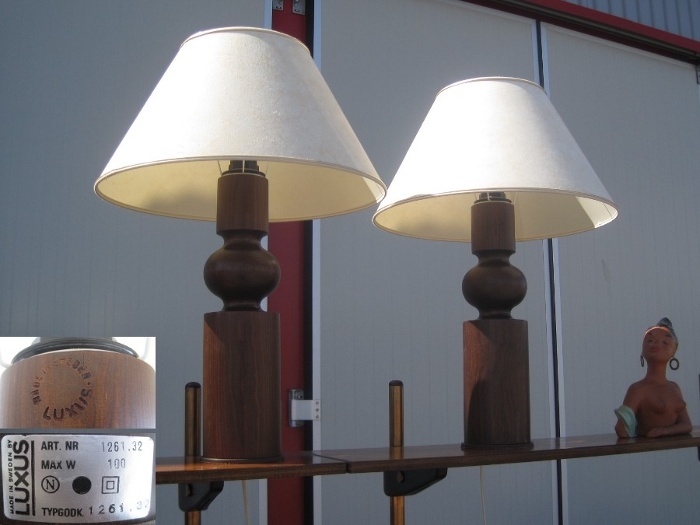 Two large Swedish 70's rosewood stained table lamps by Luxus, Sweden. The shades are not the original ones. 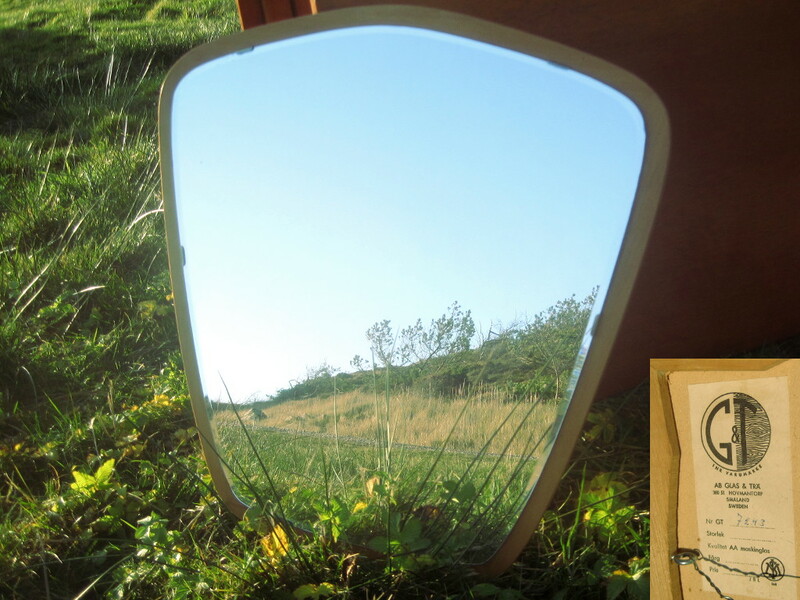 Swedish 50's light oak wall mirror by Ateljé Glas & Trä Hovmantorp. H=53, W=52 cm. 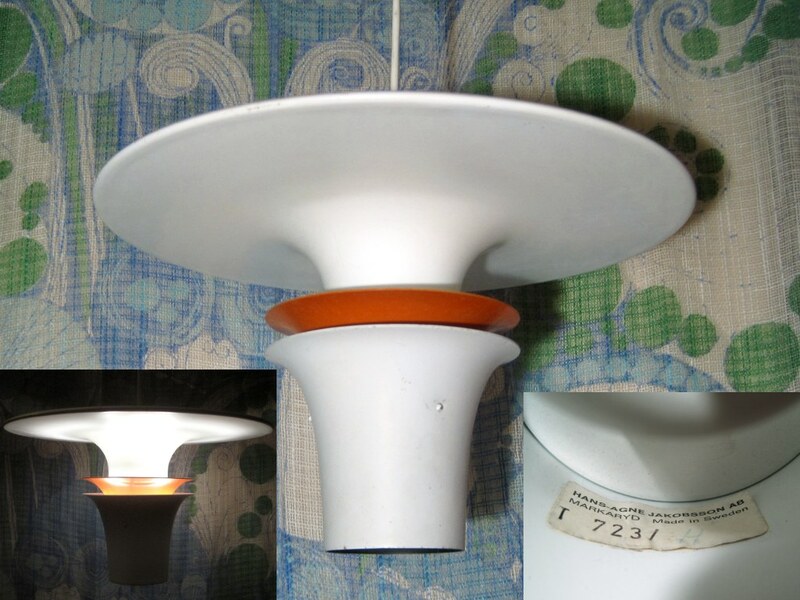 Rare ceiling lamp with ceramic shades, Marian Zawadski, Tilgman 1955. 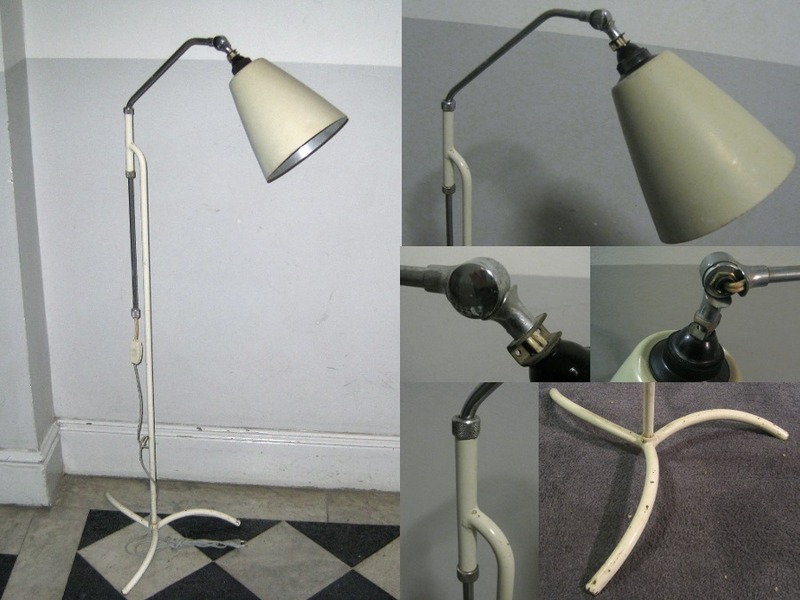 Standard lamp with adjustable height 175-230 cm. 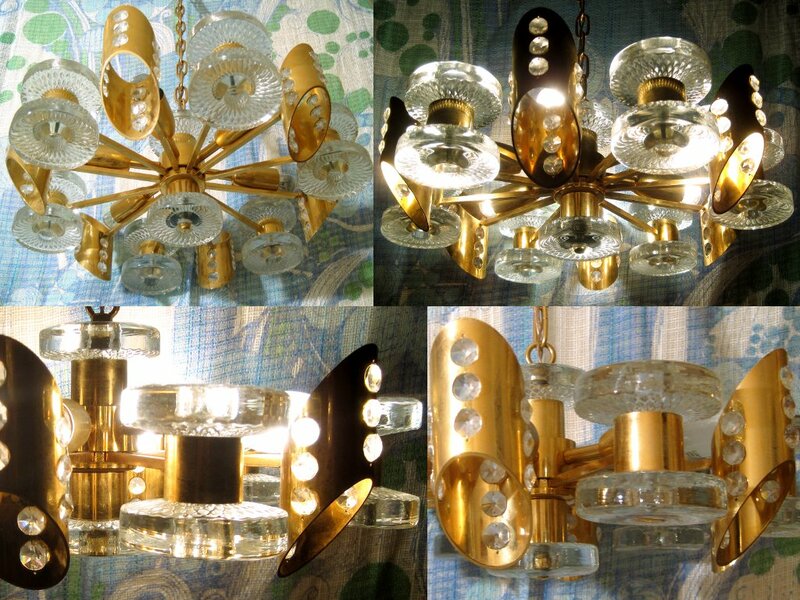 60's or 70's gilt metal & glass ceiling lamp with prisms. Possibly by Carl Fagerlund, Orrefors. Diameter 40 cm. 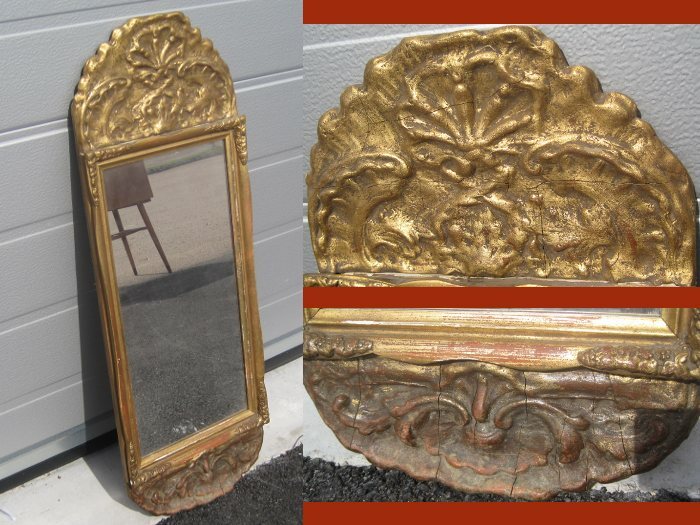 20th century gold coloured mirror. H=83, W=30 cm. 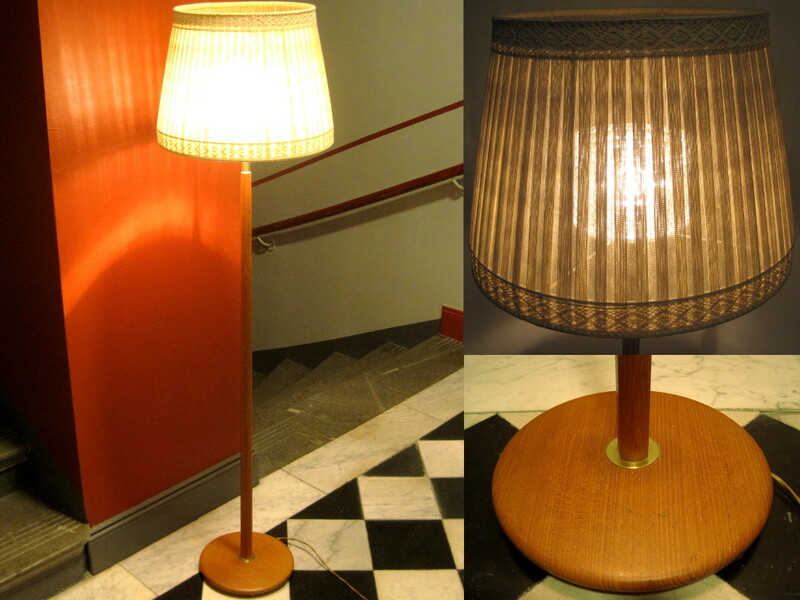 50's chrome and lacquered metal floor lamp with adjustable height 125-150 cm. A small detail missing on the arm. Old wiring but the part from the switch has been replaced with a new one with euro plug. We'll replace all the wiring at the additional cost of 100 SEK. 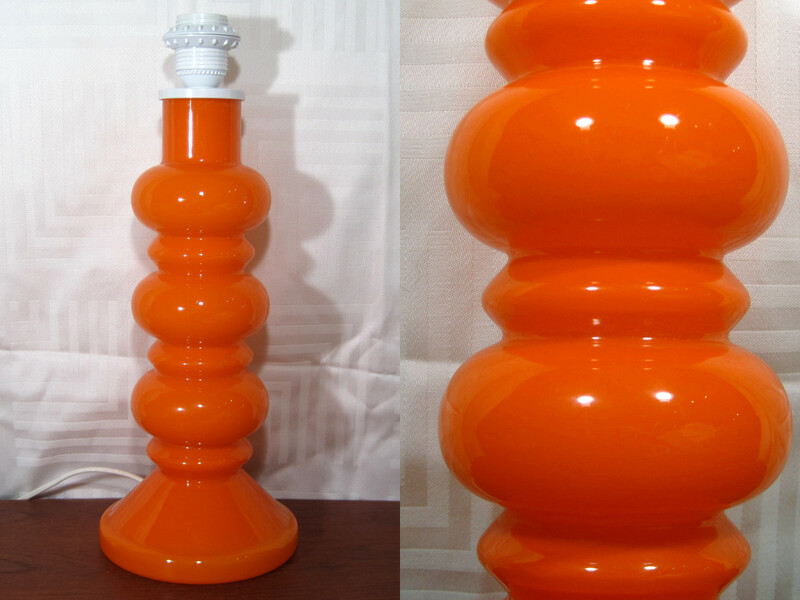 70's West German ceramic floor lamp by Walter Gerhard. 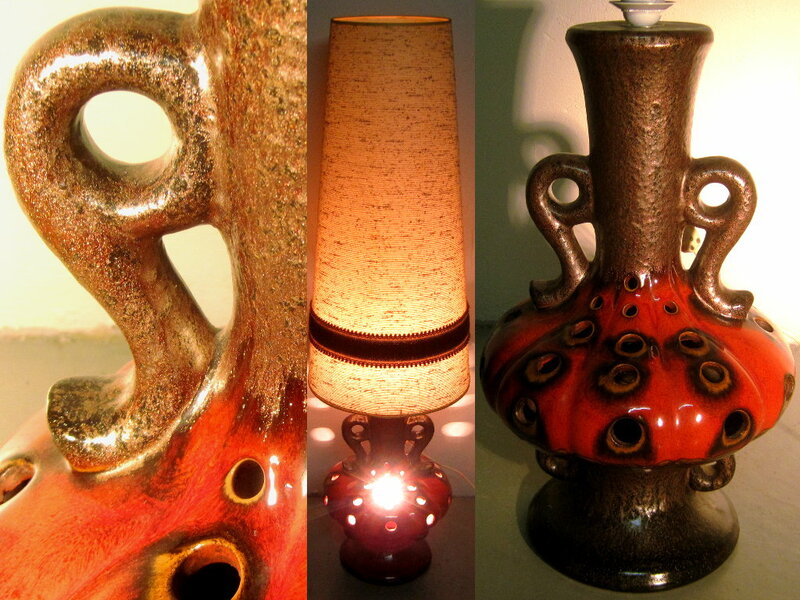 Lamp fitting both on top and inside the lamp base, wonderful glaze in red and bronze. 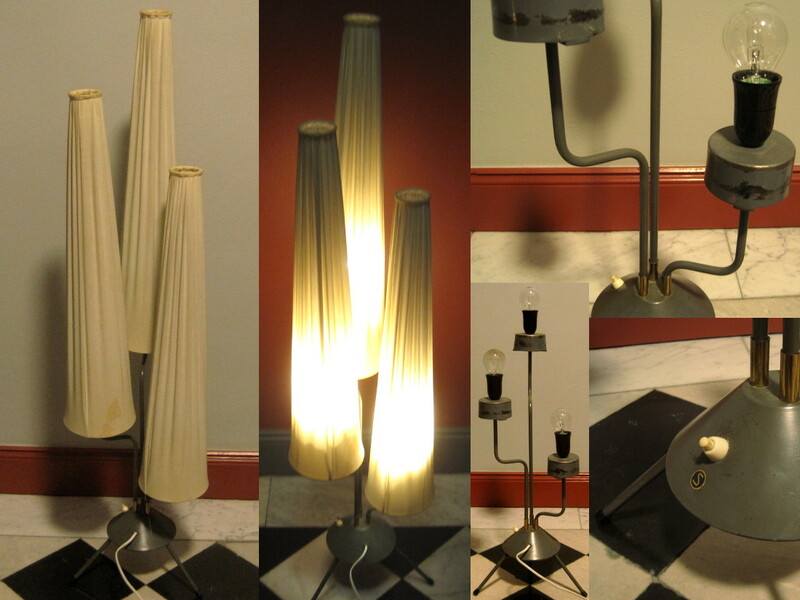 Sewdish 50's or 60's rare three arm grey lacquered floor lamp with tall, conical shades. Original fabric with some wear. Base is marked STA Typ 603. Re-wired with flat europlug. Total height 126 cm (61 cm without shades). 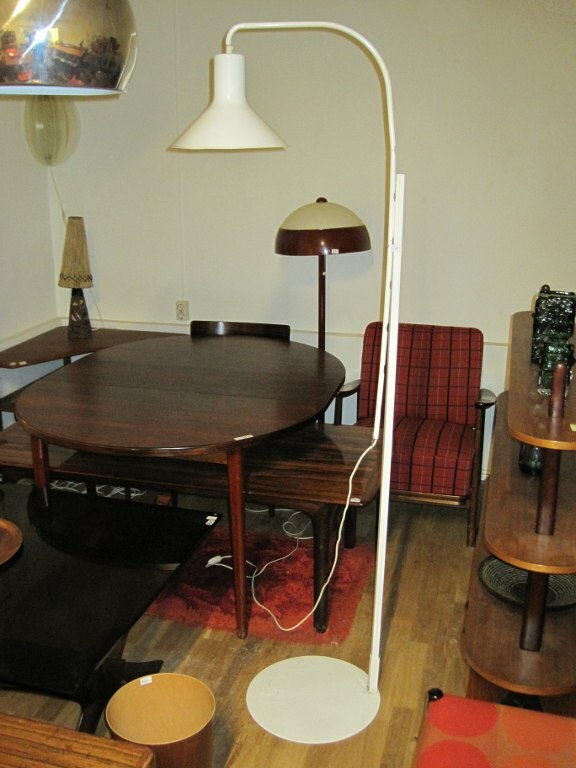 Swedish 60's oak (looks like teak) floor lamp. Large shade in greenish beige textile and inner glass shade. H=151 cm. Older plug, may be replaced with flat europlug at an additipnal cost of 50 SEK.